"Big American Horn," "Five Horsehairs and the Soul of an Afternoon" and "Saving the Day"
and lay me down to die? 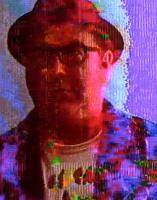 A multi-media artist living near Washington, DC, Jeff Bagato produces poetry and prose as well as electronic music and glitch video. Some of his poetry and visuals have recently appeared in Empty Mirror, Futures Trading, Sheila-na-Gig, H&, Slipstream, and Midnight Lane Boutique. Some short fiction has appeared in Danse Macabre and The Colored Lens. He has published nineteen books, all available through the usual online markets, including Savage Magic (poetry) and Kill Claus! (fiction). A blog about his writing and publishing efforts can be found at http://jeffbagato.com.